Thai food + Chrissy Teigen = pure bliss. Well, for me anyway. She’s hilarious and gets so excited about food. And those two reasons alone make her my hero. I love that despite being a beautiful model that travels the world, is married to an amazing musician, and is smack dab in the celebrity world, that she’s not ashamed to point out her imperfections. And she does it with a good dose of humor. Honestly, they’re imperfections that really aren’t imperfections – like stretch marks – but the fact that she points out that she has them makes her totally relatable. I admire her for putting herself out there and just being raw, but at the same time not really hurting anyone – unless they hurt her first, for which I don’t blame her for fighting back. (Especially when it comes to her baby daughter. I totally get the mama bear attack mode thing.) Honestly, it’s the kind of courage that I wish I had. She doesn’t seem to be hung up on wanting everyone to like her and to me that’s admirable and something I need to work on. I know that no matter how nice I am, not everyone I meet is going to like me. That’s just reality and human nature. But inside all I can think is, “Why?” I mean, come on now <wink>. I’ll be posting more of her recipes from her cookbook and will definitely be sharing more of my Chrissy Teigen love with you. But on to this amazing recipe. I’ve mentioned before that Thai basil is one of my favorite fragrances – next to Drakkar Noir. Seriously, the two of them make my knees weak. 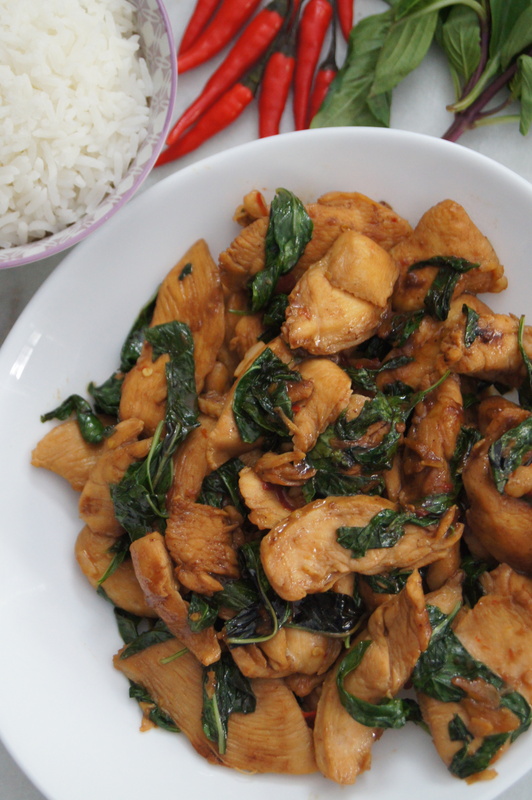 So when I started prepping the Thai basil for this recipe I was already in love. What made me love it even more was mashing the garlic and chile in my mortar and pestle. The aroma was so sweet – and honestly, it felt kind of good to smash something. The mistake I made with the Thai chile was using too much of it. The recipe says to use “as many fresh Thai chiles as you can stand.” I really didn’t know what the amount was so I used the same amount as the garlic: 5. 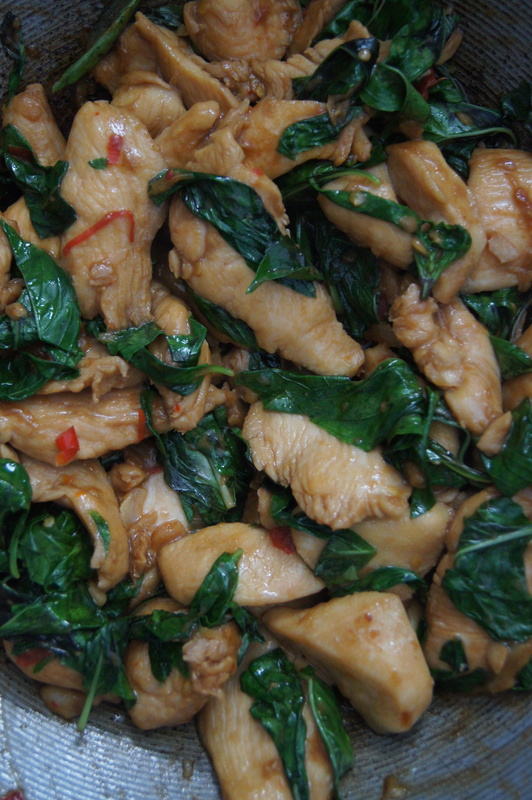 Pad Grapow Chicken was really easy to put together and the flavor was outstanding. Because I made it just a little too spicy, I needed to balance some sweetness into it, so I added about half a tablespoon of Thai sweet chili sauce when it was done cooking. It actually added a nice, sweet flavor to the chicken without overpowering it. And it helped extinguish the fire in my mouth. I can’t wait to make more of Chrissy Teigen’s recipes and share them with you. Maybe they’ll make you like me if you don’t already. Totally kidding. 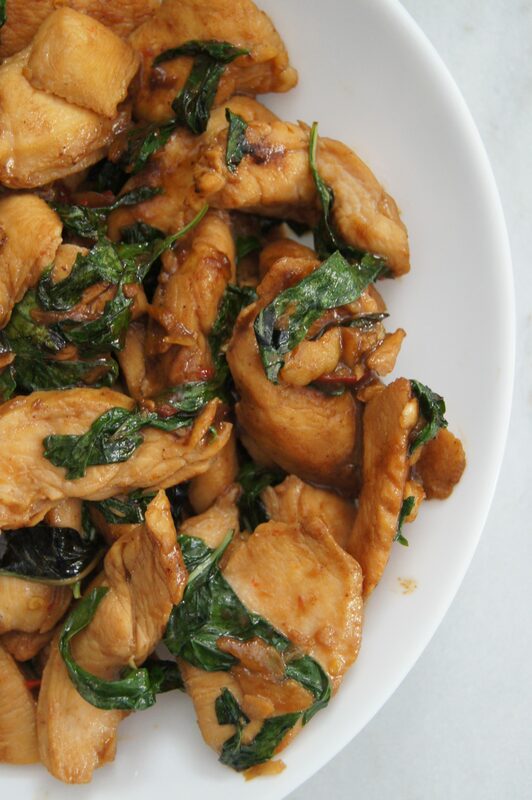 In a bowl, toss the chicken with the oyster sauce and soy sauce and marinate for 10 minutes. 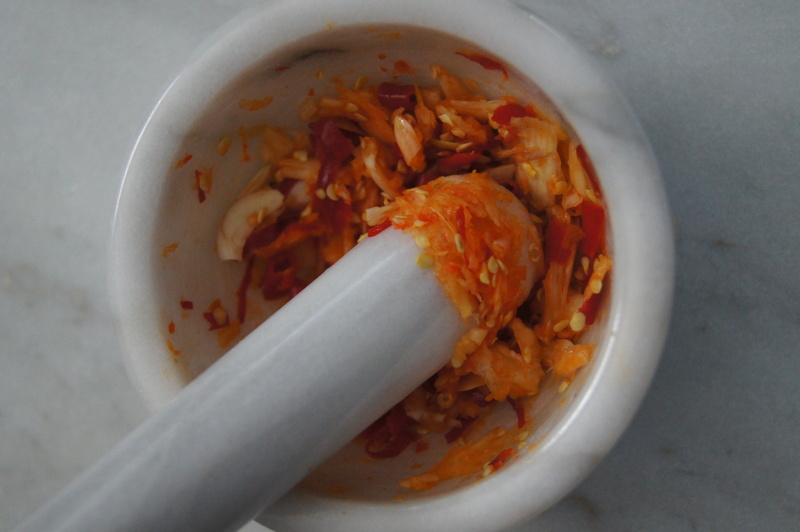 Mash the garlic and chile in a mortar and pestle until finely smashed (or mince with a knife). In a large skillet or wok, heat the oil over medium-high heat. When the oil is shimmering-hot, add the garlic-chile mixture and cook until fragrant, about 30 seconds. Increase the heat to high, add the chicken, and cook, stirring, until just cooked through, about 4 minutes. Add the basil and cook until wilted, about 1 minute.